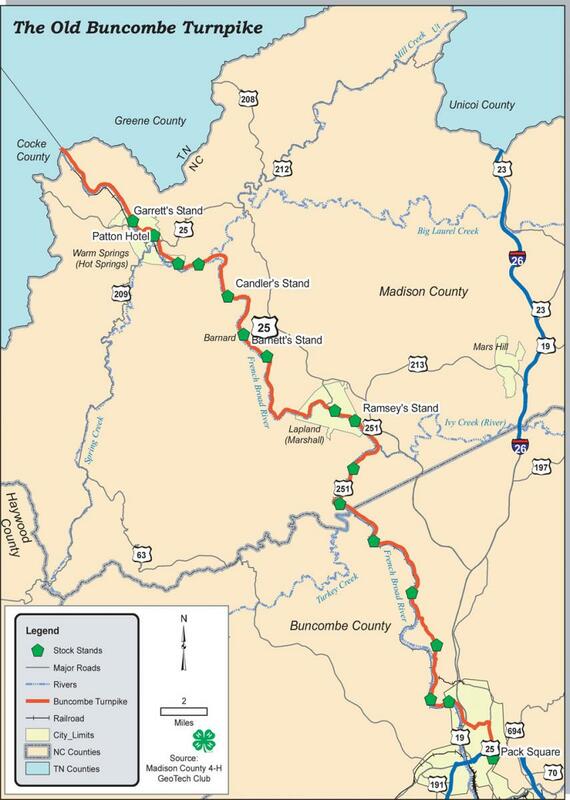 The Buncombe Turnpike, a 75-mile route through North Carolina from the South Carolina border to the Tennessee border constructed between 1824 and 1828, opened the western part of the state to settlement and trade. David L. Swain, then a Buncombe County legislator, sponsored a bill in 1824 "for the purpose of laying out and making a turnpike road from the Saluda Gap . . . by the way of . . . Warm Springs to the Tennessee line." Three Asheville men-James Patton, Samuel Chunn, and George Swain-were authorized to sell $50,000 of stock in the company. The collection of tolls further financed the project. South of Asheville, the Buncombe Turnpike followed approximately the same course as present-day U.S. 25 Business through the communities of Flat Rock and Hendersonville. 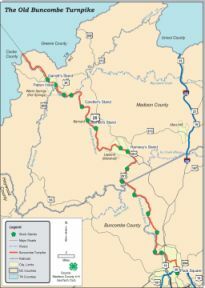 North of Asheville, its route followed the east bank of the French Broad River across Beaver Dam, Reems, Flat, Ivy, and Laurel Creeks to Paint Rock and the Tennessee state line. Well constructed and maintained, the highway was called the finest of its day in North Carolina. The turnpike's effects on western North Carolina commerce and development were striking. The Mountain region, long isolated, was opened to settlement. Stagecoaches and mail delivery established regular routes. The resort business began to flourish. Other roads were developed to feed into the turnpike. 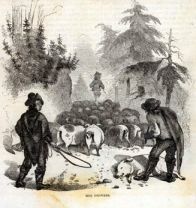 Fowl and livestock were driven to markets in Charleston, S.C., and Augusta, Ga., via the turnpike, and corn planting increased to feed the large droves. In 1849 William A. Lenoir spent the night in an inn south of Asheville with, he wrote, 5,000 hogs and 75 people. By 1850 the heavy animal traffic had necessitated repairs, and sections were converted into plank roads. In the post-Civil War period the railroad, following much the same route, supplanted the turnpike as the principal commercial transportation artery. Ora Blackmun, Western North Carolina: Its Mountains and Its People to 1880 (1977). John C. Inscoe, Mountain Masters, Slavery, and the Sectional Crisis in Western North Carolina (1989). F. A. Sondley, A History of Buncombe County, North Carolina (1930). Map of portion of the Old Bumcombe Turnpike. Created by Madison County 4-H GeoTech Club Map developed by members of the Madison County 4-H GeoTech Club: Nezzie Covington, Anna Farlessyost, Will Farlessyost, AJ Jackson, Sierra Kindley, Cullen Owen, Morgan Owen, Sylas Owen, and Drew Yost. courtesy of LearnNC. Available from http://www.learnnc.org/lp/editions/nchist-newnation/4304 (accessed October 11, 2012). "Hog drovers in western North Carolina. Illustration from Harper’s New Monthly Magazine , October 1857." Image cnline from LearnNC. Available from http://www.learnnc.org/lp/editions/nchist-newnation/4304 (accessed October 11, 2012).